I started Return Once More on a whim. I forgot my kindle and in an act of desperation I started reading on my phone. This novel quickly sucked me in though and I ended up reading about half the novel in one sitting. Yes, it’s that kind of book! Return Once More takes place in the future. The Earth has been abandoned and Kaia Vespasian is an apprentice historian. Historians travel back in time and observe the past so they can learn from it and better shape the future. A side effect from this traveling is that they are now able to tell you who your soul mate is. After Kaia learns who her soulmate is she can’t help visiting ancient Egypt to meet him. The problem is the teachers and classmates Kaia’s trusted might not be so trustworthy. Kaia took me a little while to warm up to. I liked that she was a go getter but she rode the line between go-getter and just charging in to danger for no reason. By the end of the story though I was firmly on Kaia’s side and I couldn’t wait to learn more about her life! One of my favorite aspects of this story is that the setting of this novel was constantly shifting. It was partially in ancient Egypt, early America, and the future. I like how Trisha Leigh seamlessly wove these settings together. 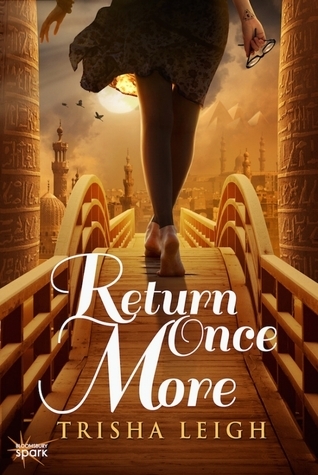 Overall, Return Once More was a really engaging and fun read. It sucked me in and the cliffhanger we were left on has me excited for the next installment in this series! This seems really interesting! I've never heard of it before, but your review seems promising. Did you like the soulmate aspect of the book? I might pick it up! The soulmate aspect was interesting but the entire story didn't revolve around it. I'm not really a fan of books that focus exclusively on romance and this one didn't. It had just the right amount of swoons! I really loved this book. I am glad to see you did too. I can't wait for the sequel, that ending OMG! I just find out about this book thanks to you but it sounds really great! I'm going to try it! Great review.